Our skin is what the world sees of us, and so we yearn for a good-looking skin. A supple skin gives us a good physical appearance and a boost of confidence in dealing with the world. While not all of us have inherent flawless, Diana Stalder Skincare Center offers to beautify you inside and out! Diana Stalder Skincare Center has more than 20 years of facial care experience. They are equipped with start of the art facilities to help improve your less than perfect complexion. Their well-trained therapists are ready to assist you in making your skin glow and radiant. Diana Stalder Skincare Center is one of the most eminent skincare clinics in face, skin and body care today. And I was glad to join in their recent "SPArty" at Gateway Mall in Cubao, Quezon City. 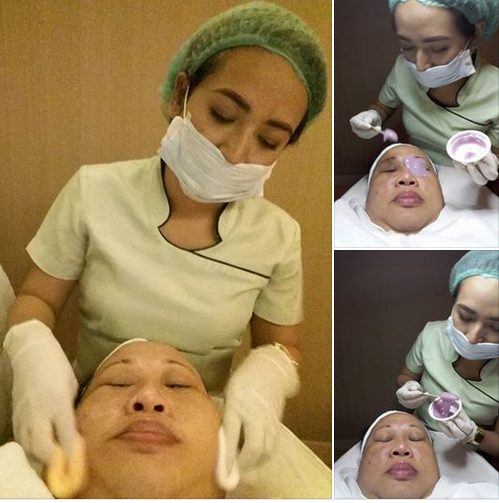 Guests were treated to their Signature Facial which consists of 15 steps. The relaxing facial started with cleansing. They use hypoallergenic cleanser depending on your skin type. I have sensitive, combination skin that needs exfoliation. Diana Stalder skin regimen involves the application of elixir, rejuvenating mask, hydrogel and creams to prepare the skin to accept hydration. After undergoing steam treatment, the therapist started on the pricking phase. I found this to be a bit painful especially when being done on the sides of the nose. Next, a device is used to close the skin pores. Toner is then applied to restore my natural skin's pH. Bi Phase Mask followed shortly which was cold and refreshing. After the whole treatment, I notice that my face appears supple and smooth to touch. There is noticeable improvement in muscle tone both in my face and neck. My fine lines and wrinkles seems to have diminished. Do try out their Signature Facial and be amazed at what it can do. Diana Stalder Skincare Center pioneers in skin care and wellness in the Philippines since 1996. They offer a combination of skin care practices and new product discoveries in their branches nationwide.